Hello everyone and Happy 2019! 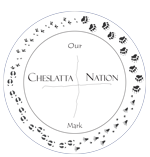 The Cheslatta Carrier Nation is back online and ready for an exciting year. We’re in the process of developing our new website. Until the work is complete we’ll use this page to post messages to keep members updated on developments with CCN. I’m pleased to invite Cheslatta members to attend a Band meeting on Monday, January 28 starting at 10:00am. Program updates will be provided and lunch will be served at Noon. I hope to see you all there! Mussi.